Childhood obesity has become one of the biggest health concerns in the United States, according to My Overweight Child. 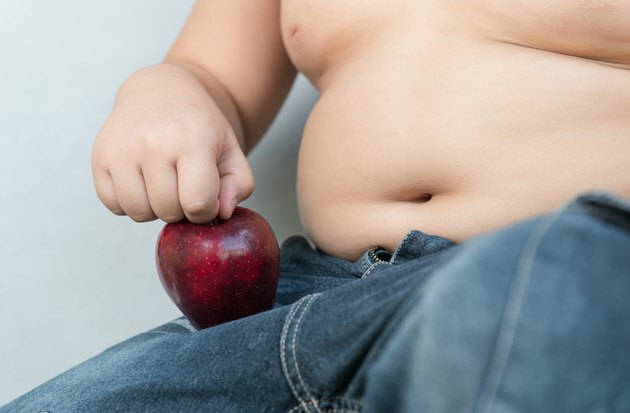 Genetics, a diet high in fat and sugar, overeating and living a sedentary lifestyle can all contribute to an overweight child. You can help your child lose excess weight and begin a healthy life by promoting daily activity and better food choices now. Make an appointment with your child's doctor. He can check for any underlying medical problems that could be causing your child's weight problem and possible factors contributing to difficulty losing weight. The doctor can also recommend a healthy weight and provide the steps to achieve it healthfully. Limit your child's daily calorie content. Moderately-active 5-year-olds, whether male or female, need 1,400 to 1,600 calories daily, according to the U. S. Department of Health and Human Services. The daily caloric need increases or decreases, depending on whether your child is active or sedentary. Give your child a variety of healthy food choices for each meal and snacks. Provide fresh fruit, vegetables and low-fat protein and dairy choices. When your child wants cereal, toast or other bread products, offer whole-grain options. Avoid high-sugar, high-fat foods and limit the child's intake of desserts and soft drinks. Encourage the child to drink water instead of sweet beverages. Serve smaller portions. Encourage your child to eat slowly and tell you when hunger is satisfied. Do not force him to finish his meals if he isn't hungry; this can lead to overeating and weight gain. The American Council on Exercise recommends reducing the size of meals by around 10 percent. Limit sedentary behaviors. Allow only one to two hours of television, video games and other inactive hobbies per day. These habits can lead to an inactive lifestyle, which will continue into adolescence and adulthood. Encourage exercise and active hobbies. Include at least 60 minutes of physical activity in your child's day. You can use one long session or split it up into smaller sessions throughout the day. Get the whole family involved and use a variety of activities your child enjoys. Exercises can include sports such as soccer or basketball, swimming, playing hide and seek or tag, walking the family dog and cycling.